I hope it doesn’t sound too pretentious, but I started really early, about when I was eight and nine years old. My mom saved all the stuff I used to write and wrote the dates on them. Those are, of course, pretty bad! I even showed them at several kids book events I did and saw I had spelled ‘author’ as ‘arthur’! I was always dressing up and making up stories and couldn’t keep track of what I was doing anymore, so I started writing it down. Early on it was mostly fantasy and science fiction stories before I started submitting to contests in high school and writing ice hockey articles for some local magazines. After writing part-time for my local newspaper and working in senior healthcare, I started looking into e-publishing for all my vampire stories. So really, I’ve been writing for over twenty years, so it is more a question of when wasn’t I a writer or telling stories, because I feel like I always have been. What got you to start loving horror? Wow, back when I started writing horror in the late nineties, there really wasn’t that much to read. Just King, Rice, the biggies you know. So I wrote what I wanted to read, first and foremost for myself. I was interested in exploring good and evil and consequences. I like vice in fiction, a way to explore danger and fear without actually doing anything scary! I think that came from watching a lot of paranormal shows and scary movies as a kid. I wasn’t afraid watching, but more fascinated with why the scares work in making you jump and scream. Why are fear and adrenaline so connected? Why do we enjoy scaring ourselves and activating that fight or flight response? I watched a lot of The Twilight Zone, and I used to study scenes in Psycho and Alien to see what is so frightening in them. I like the mirror to nature genre examination. In horror, it is okay to say that violation of the home or body and all we hold dear is scary to us. I do still write fantasy and SF, I have to alternate and give the scares a break at times, but I like the healthy exploration of fear or monstrosity. 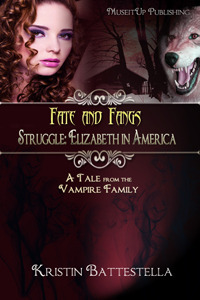 What was the inspiration behind the Fate and Fangs series? When The Vampire Family was first published in 2008 with Eternal Press, there was a lot of material that didn’t make it into the final novel. 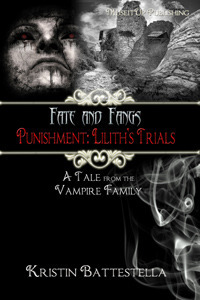 The timeline jumps around and there are several family members that come and go through the ages, and The Vampire Family was more about the centuries old coven wars between the Welshires and Lilithan vampires, so the more quiet, personal vampire stories didn’t quite fit. Instead of going right to the next novel, I wanted to have the bit of ‘getting to know you’ vampires through history moments in between with specific over reaching themes. So you have Love, Punishment, Struggle, Debauchery, Lust, Humanity, and Resurrection with each asking but not always answering the questions about choosing between good and evil, i.e. 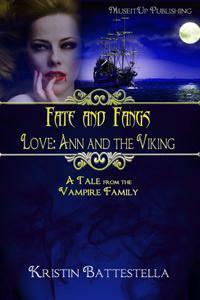 Fate and Fangs. Each also takes place in a different era, from Viking times to colonial America, and post war speakeasies. I like having vampires pop up in unusual times and places. Tell us about how you got involved with Morning Coffee? Morning Coffee is the flagship show for the RadioVision Network here in South Jersey. One of my fellow local paranormal authors I met through the NJ Authors Network Stefani Milan invited me as a guest to her show focusing on books and writers on the network, called Read All About It. When I spoke to the staff more after they heard about all the cool horror media talk in Horror Addicts Guide to Life, they invited me as a recurring guest to talk about movies, television, and where to watch options. I just started not that long ago, but hopefully it’s an informative segment for audiences looking to cut the cable cord and find more of what’s out there then what the box office tells you. Also, you can see how pale I really am in the video archive on the radiovisionnetwork.com website! Addicts who’ve read my articles here know I love Dark Shadows and old school Hammer and Universal scares. Most of what I like is older and spooky, but I love mainstream classics, too. My favorite movie is The Searchers, actually, a John Wayne western, and my favorite actor is Montgomery Clift. One of my all time television faves is Blake’s 7, with Homicide: Life on the Street a close second. I tend to lead towards more British shows, too, but I’m behind on all the big franchises. I’m more into Star Wars, Star Trek, and Lord of the Rings, which somehow, makes me feel old now more than watching old movies! What will you be reading for episode 116 of the podcast? 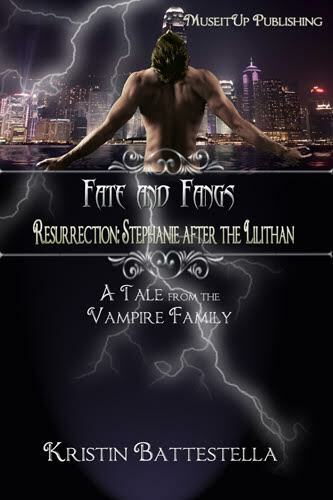 My reading tonight is a condensed version of Resurrection: Stephanie after the Lilithan, Book 7 in my Fate and Fang: Tales from the Vampire Family novella series with Muse It Up Publishing. The series is a set of personal vampire vignettes in between my first The Vampire Family novel and the sequel I’m working on now, tentatively called Requiem for The Vampire Family, so this is a bit of the middle piece catching up what has already happened and bridging what will come next. In Resurrection, former vampire Stephanie frets on the human ho-hum and has a disturbing visit with the mysterious and magical Mestiphles – who gives and takes life as he sees fit. I’m not sure if my reading is perfect, though. I think I flubbed up a few times on my own character names – you aren’t thinking about if they are easy to pronounce when you only write them! However, I really enjoyed doing a dramatic reading. I do read all my writing aloud when I write it as a final editing polish, but it is very cool to know others will hear it this time! So, thank you for the opportunity, Addicts, and I hope you enjoy it! Where can you we find you online?